Additional sizes available with add on pricing. 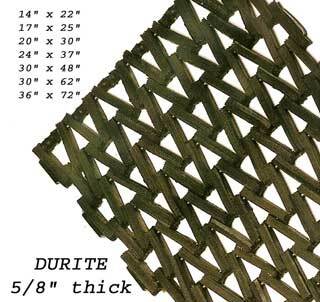 Patented in 1923, Durite is one of the toughest, long lasting anti-fatigue mats available today. Gives you dependable service indoors or out. Durite, the original tire-link mat, helps create foot comfort and safety traction especially where people stand for long periods of time. The open mesh construction provides excellent drainage and dirt retention. Durite 108 mats are easily rolled up for thorough cleaning and convenient storage. These industrial mats are perfect for in-plant applications at workstations, along assembly lines, in front of machines or in aisles and passages. Special sizes, beveled edges and irregular configurations available upon request.